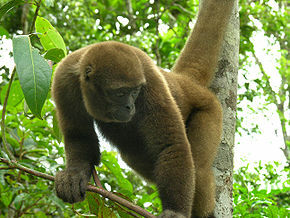 The big primates have a dark woolly fur and a round head. Their tails serves to grab. Wooly monkey are 50-70cm long with their tail 60-70cm. They weigh 5-10kg. Wooly monkeys are living in the tree tops and mainly feeding on ripe fruits. They are living in groups (various families) of 10-70 individuals.